This recipe is a bit of a fusion with the duck confit being a French classic and the Risotto originating from Italy. I normally don't go for fusion dishes as I think the idea is usually better than the outcome but this one works superbly well. The duck confit is very rich so one leg is enough for four dishes with the succulent meat simply shredded on top of the risotto. The finished product is creamy, earthy and fairly rich, meaning small portions or served as a starter is probably the route to go. Making Risotto is a bit like making a curry in that it has numerous stages with each adding a different layer of flavour. Perhaps not one for a midweek dinner in a hurry as it does take a bit of time, so I recommend saving it for the weekend with a couple of bottles of wine. 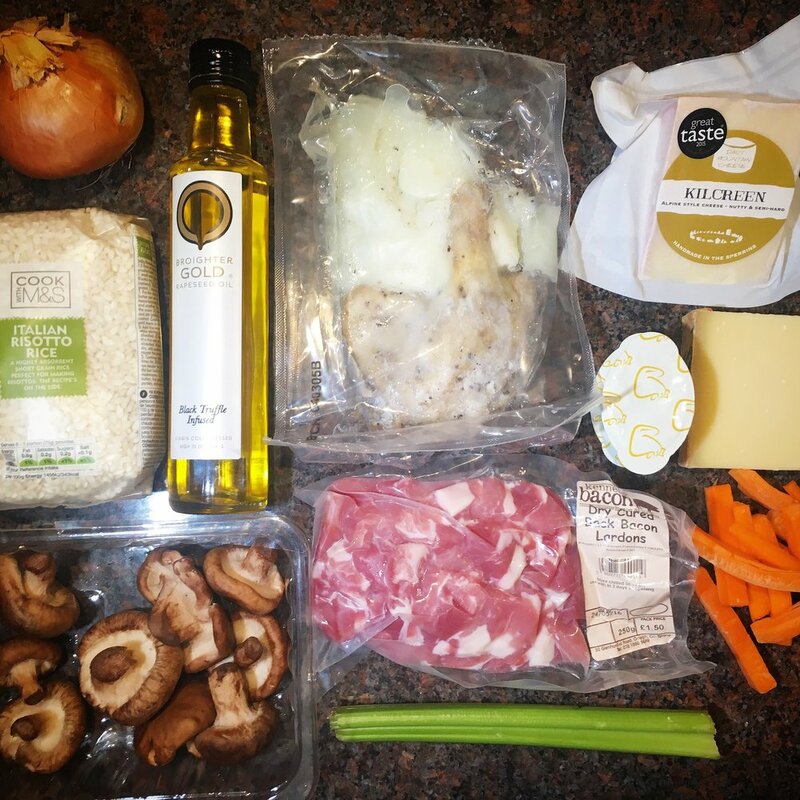 The first stage to making a risotto is traditionally called the soffritto which is the flavour base for the dish. 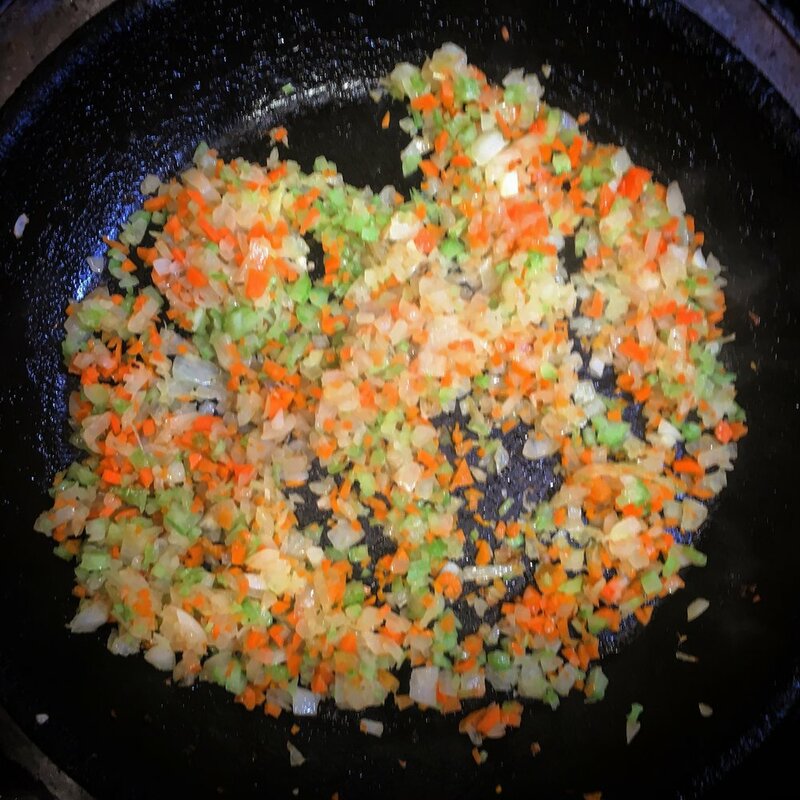 For my soffritto I made simple a mirepoix by finely chopping onion, celery and carrot. Fry on medium heat along with four tablespoons of olive oil for fifteen minutes. After fifteen minutes remove the soffrito to a dish and set aside. 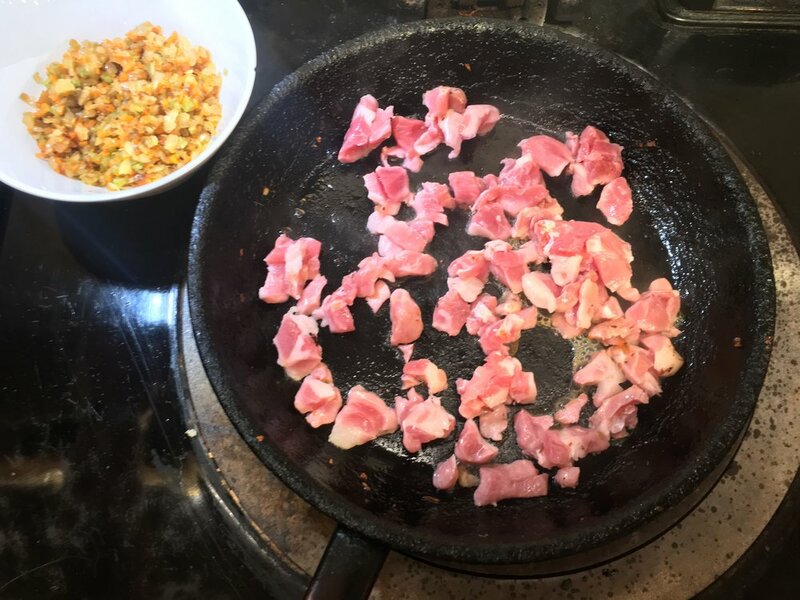 The next stage is to add the bacon lardons so turn the heat up high until it starts to smoke and add two tablespoons of olive oil and fry until slightly crisp and the fat has rendered. The final stage before adding the rice is to add the chopped shiitake mushrooms and garlic and fry for a further five minutes until the mushrooms have softened. Add the soffritto back to the pan and stir well. Now for the rice, allow 65g per person and add to the pan along with another three tablespoons of olive oil and fry on medium to high heat. The idea is to toast the rice before the liquid stock is added. You are aiming for the edges of the rice to become translucent and the centre to still appear opaque. 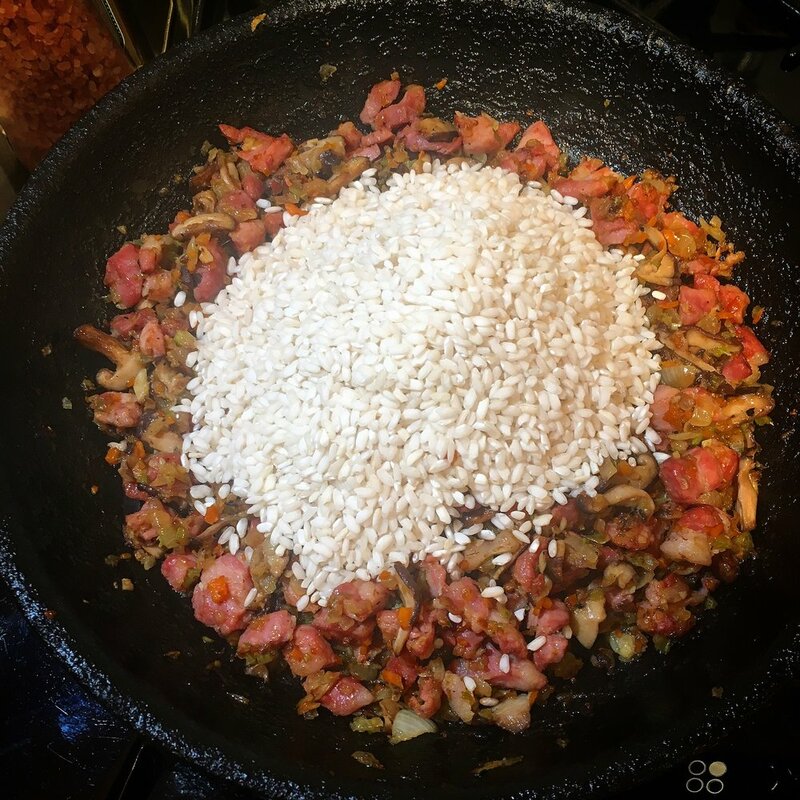 This stage is crucial in ensuring maximum flavour is absorbed by the rice as it fries in the rendered bacon fat and olive oil. 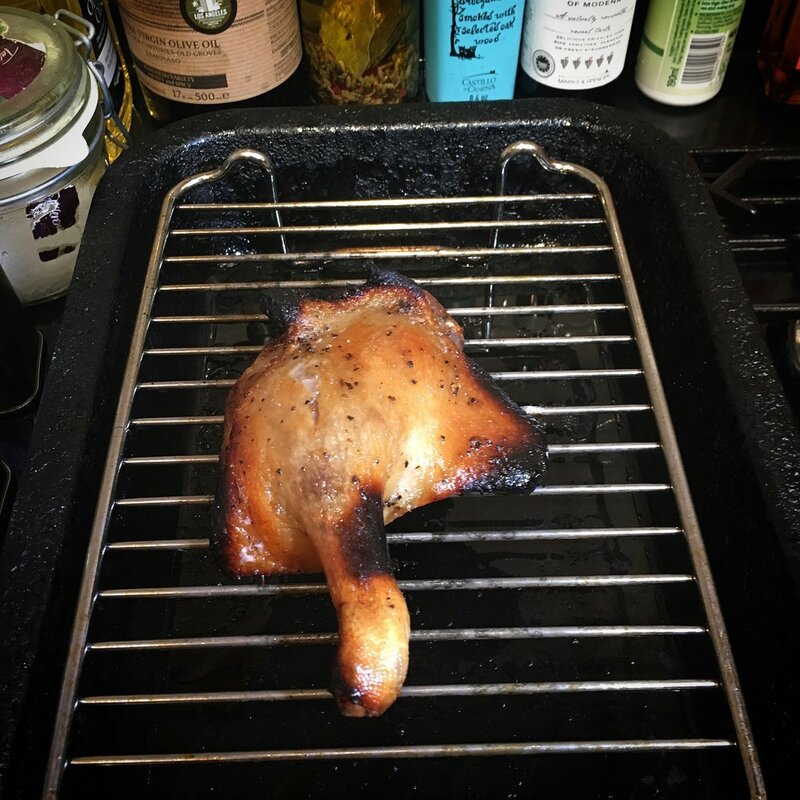 While the rice is toasting put the confit duck leg in a preheated oven at 180ºc and roast for ten minutes. As the duck has been previously cooked it just needs to crisp up and heat through. Unfortunately I didn't have any homemade chicken stock but I find the Knorr Stock pots are a great and convenient alternative. Add two pots to a jug of boiling water and stir well until completely dissolved. Next you need to deglaze the pan with the white wine so pour in and ensure all the caramelised bits are scraped from the bottom and incorporated into the dish. The next stage of the dish takes a bit of patience. Add a ladle of stock at a time until it's absorbed by the rice, repeat this process until the rice is cooked al dente. This is probably the most crucial element of the dish as it is this gradual addition of stock along with stirring which will make the rice release the starch making its own creamy sauce. This process should take around twenty minutes for the quantities quoted. 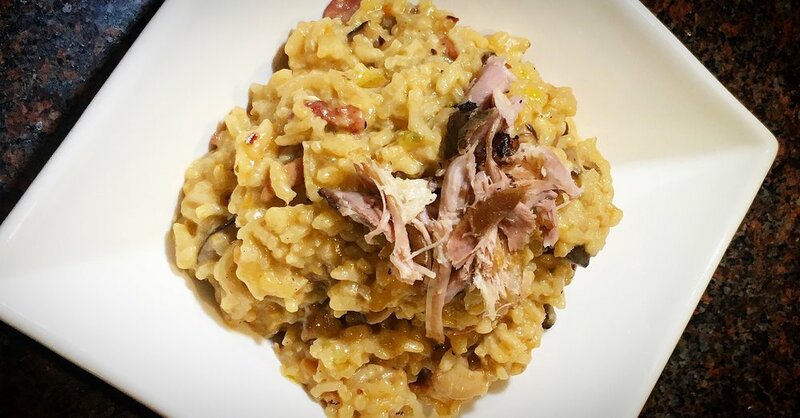 You are aiming for a consistency similar to thick porridge and if you were to run a spoon through the risotto it should slowly fill the space. The final step is to add one final ladle of stock along with a cup of cheese and two knobs of butter. I used two types of cheese in Parmesan and a local semi-hard nutty flavoured cheese called Kilcreen. The Parmesan adds a salty creaminess to the rice and the butter further enriches to provide an excellently umptuous dish. Stir well and cover with tin foil and let the risotto sit for two minutes while you shred the duck leg. To serve place a small amount of duck on top of the risotto and finish with a drizzle of Broigher Gold Truffle in fused Oil. Although this dish takes a bit of time and attention don't be put off as there isn't too many things that can go wrong. I got the majority of the ingredients from Indie Food located in Comber. Much like this site it focuses on showcasing the fantastic produce our country has to offer. Pop into their shop located on High Street or visit them online at indiefude.com.